For trenchless drain repair in Ottawa, Dr. Pipe Drain and Plumbing Services cannot be beaten. We are the industry leaders in this field, offering several options for drain repair. Because of this, we are the most cost-effective and least inconvenient service providers available. This is one of our most popular services. Per the name, it is a no-dig option. 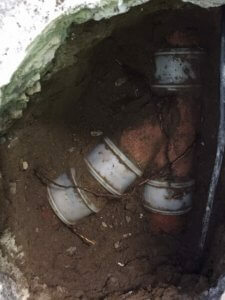 You don’t need to excavate to repair the pipe, which saves your time and money on yard renovations. A new pipelining is pushing through the old one as a repair to the damage. It is then inflated using pressure to seal the damage in the old drain watertight. The next step is to cure it with heat. Once it is fully cured, the drain is effectively repaired. The resulting pipe should have full structural integrity and function. Using a special high-pressure machine, we burst the pipe inside the ground to small particles. At the same time machine carries the new pipe with it. We provide a consultation where we discuss the most appropriate materials for the repair. This method results in a fast, reliable, long term, inexpensive solution. More importantly, it doesn’t disrupt your right to fully access your property during the repairs. Why choose Dr. Pipe Drain and Plumbing Services? Finding a licensed plumber is easy. If you want a plumber that respects your home and your time, come to us. When you call, we make sure your customer experience is as professional as possible. We make appointments that are convenient to you, and let you know when we’re on way. During the repair, we keep the work area as neat and covered as possible. We apply the most appropriate solution so that work is completed fast and efficiently. Dr. Pipe Drain and Plumbing Services does more than plumbing. We can help you figure out your way around insurance companies and city bureaucracy. All the appropriate permits for the job will be. We recommend rebates provided by the City of Ottawa. You will get our help to apply for the ones for which you qualify. We are your neighbourhood Ottawa plumbers. Check out what your neighbours are saying about us. Then, call us to set up a free, no-obligation inspection.